"I just got this scripture study system and am so excited to dig into it more. So far my scriptures look awesome and I have already been able to find scriptures more easily. While I am not of young missionary age, this would be such an amazing way to study your scriptures in preparation for a mission. I however think all members should find ways to become more familiar with the scriptures and this marking system is the best I have seen. " All the missionaries wish they had them! "I love this system. It has been such a motivator for scripture study by giving me a task to study a specific topic. I feel like my annotations will be better utilized now that I have a system to mark the pages." - Sonya M.
These are an invaluable tool. "I'm preparing to serve a mission, these are an invaluable tool. The elders in my ward want some now!" Bottom line, you would benefit from HolyTabbs. "What's great about the system, is that when my kids ask me a question, I can quickly look at the front cover, find an appropriate topical response, and then have a few different scriptures to amend my response. Bottom line, you would benefit from HolyTabbs. It would be great for any LDS teacher, from gospel doctrine to sunbeams, seminary students, bishoprics, families, and of course, missionaries." Best $15 bucks I will probably ever spend for my mission. "...You could say I'm hooked and totally jumped on that bandwagon. Basically you mark the heck out of your scriptures in an organized way so you can have a zillion scriptures at your fingertips. Best $15 bucks I will probably ever spend for my mission." I know this will really help me teach! 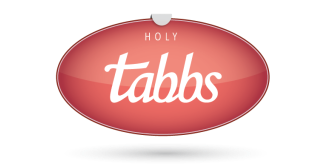 "I love Holytabbs and how it helps me focus my scripture study. Next year's youth theme is focusing on missionary work and as a young women's leader I know this will really help me teach! " Get excited about reading your scriptures daily. My HolyTabbs are motivating me. "I enjoy studying by topic, going through my quad from ancient to modern scriptures. My HolyTabbs are motivating me and I enjoy studying each day, building my testimony." It definitely gets my 5 star rating. An easy to find system.